Lighting A Revolution: Ink Blotter 224, "Mazda C Lamps"
Blotter number 224; image number: LAR_B224. 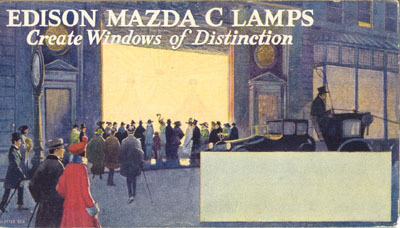 "Edison Mazda C Lamps Create Windows of Distinction." The Mazda trade-name first appeared in 1909 on tantalum filament lamps and on first generation tungsten lamps (so-called "non-ductile tungsten" lamps). General Electric built on William Cooledge's research into the metallurgy of tungsten to create a second generation tungsten lamp that became known as the "Mazda B" lamp. Irving Langmuir, also at GE, discovered that coiling the tungsten filament and putting nitrogen gas into the lamp resulted in higher energy efficiency. In 1913 GE introduced a third generation tungsten lamp based on Langmuir's design: the "Mazda C."
At first, Mazda C lamps were offered only in higher power ratings than Mazda B units, and so found use in large area lighting. 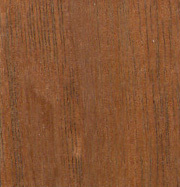 Their ability to produce brighter light also made them popular for use in store windows, as seen in the above blotter. In an age before television, display windows offered an especially important opportunity for merchants to reach out to customers visually. Main Street merchants were usually quick to adopt electric lighting and to upgrade their installations with new, brighter lamps. David E. Nye, Electrifying America: Social Meanings of a New Technology (Cambridge, MA. : The MIT Press, 1990).